With the memory of the saber-rattling prelude to the U.S.’ 2003 invasion of Iraq largely faded, many of that war’s biggest proponents have recently found themselves uniting behind a new cause – the dissolution of the Iran nuclear deal, formally known as the Joint Comprehensive Plan of Action (JCPOA). In recent weeks, their calls for destroying the deal have grown — especially as President Donald Trump, who has long criticized the deal, seems determined to make a decision on deal’s ultimate fate within the coming month. While the dissolution of an international agreement may hardly seem as imminently dangerous as the invasion – and destruction – of another country, the end-game for those seeking to annul the agreement is ultimately the same. Bolton’s op-ed essentially calls for a rejection of diplomacy – something the Trump administration has already done in North Korea’s case – and resurrects “weapons of mass destruction” claims targeting the Iranian government. For instance, Bolton makes the bizarre speculative assertion that “even U.S. intelligence could be in the dark if Iran is renting a uranium enrichment facility under a North Korean mountain.” In other words, Bolton asserts that – deal or no deal, monitoring or no monitoring – the Iranians cannot be trusted. This, of course, is hardly surprising coming from Bolton – one of the great champions of the “weapons of mass destruction” myth that led to the U.S. invasion of Iraq. Indeed it was Bolton who orchestrated the firing of the head of the Organization for the Prohibition of Chemical Weapons in order to hide the shaky foundation upon which the WMD narrative was based. Despite the fact that such weapons were never discovered, that an estimated half a million Iraqi civilians died, and that the conflict spawned the rise of Daesh (ISIS) in Iraq, Bolton has boasted that he has “no regrets” about promoting the Iraq War, and argues that the “worst decision” made post-invasion was the withdrawal of U.S. and coalition forces in 2011. 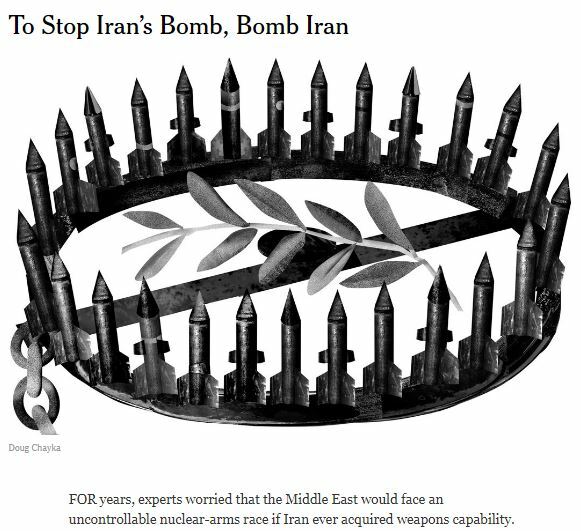 A screenshot of John Bolton’s 2015 New York Times editorial advocating an alternative to the JCPOA. However, when Bolton’s plan for a U.S. unilateral strike against Iran was thwarted by JPCOA, he then chose to argue that the only way to stop Iran from obtaining nuclear weapons would be a unilateral strike against Iran conducted by Israel. Either way, to Bolton, the only solution is war with Iran. 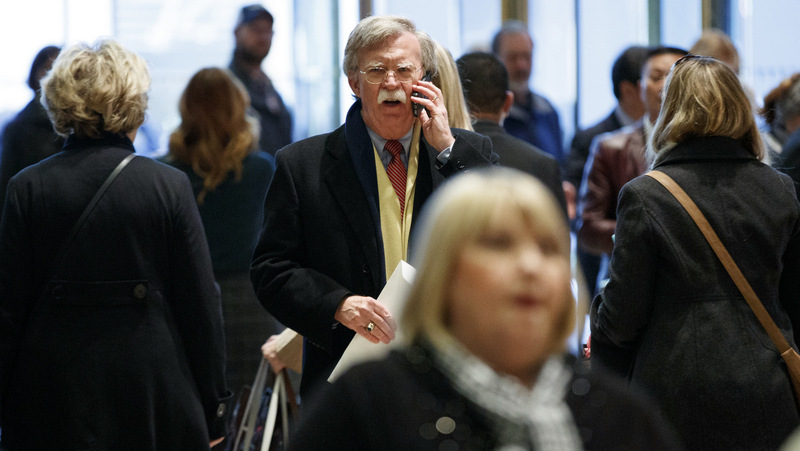 The Trump administration, which has hinted in recent weeks that it is likely to annul JPCOA, is actively considering a plan drafted by Bolton regarding how the U.S. could exit the plan. The Bolton plan, published in the National Review, essentially calls for staging a propaganda campaign for domestic and international audiences to convince them that the U.S. is “right” to withdraw from the agreement. In other words, it suggests the creation of a massive PR spectacle similar to the “weapons of mass destruction” narrative that preceded Iraq. Bolton’s plan also calls for ending all visas for Iranians – including student visas – as well as supporting Kurdish national aspirations in Iraq, Syria and Iran. 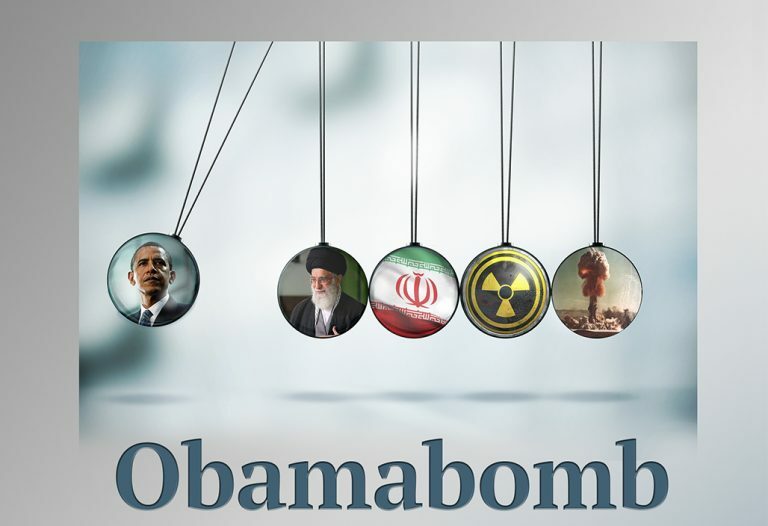 And it calls for “expediting the delivery of bunker-buster bombs,” bombs that the U.S. has threatened to use against Iranian underground facilities in the past. They are the U.S. military’s most destructive munitions, save for nuclear weapons. The Bolton Plan has been backed by numerous other architects of the Iraq War, including 45 “national security experts” who sent a letter to President Trump late last month calling for him to withdraw from the nuclear deal and to follow the plan penned by Bolton instead. One of these “expert” signatories is Douglas Feith, former Under Secretary of Defense for Policy under Bush. Feith was allegedly the person who urged the Bush administration to make Saddam’s alleged WMDs the chief public rationale for an immediate invasion. Another “expert” who signed the letter is General William Boykin (Ret. ), who served as the United States Deputy Undersecretary of Defense for Intelligence under Bush. Boykin, best known for likening the “War on Terrorism” and invasion of Iraq to “holy wars” between Christians and Muslims, was also implicated in the Abu Ghraib scandal, having been the brains behind a “secret operation” to turn the Iraqi prison into a facility similar to the infamous Guantanamo Bay. Bolton, and the chorus of “national security experts” behind him, have not had their statements heavily scrutinized by the corporate press, despite their obvious and horrendous blunder that ultimately led to the invasion of Iraq. Instead, the only alternative given equal attention by top U.S. publications has argued for the temporary decertification of the deal while its “worst” aspects are renegotiated. For example, a recent article titled “How Trump Can Improve the Iran Deal” suggests that decertification would be a diplomatic approach that would still allow Trump to renegotiate the aspects of the deal that he and his administration find particularly troublesome. It argues that, after decertifying the agreement, the Trump administration can “fix” the agreement by imposing demands that Iran is unlikely to accept. Analysts have noted that such an approach is wishful thinking and would ultimately lead to the deal’s dissolution — and to war. Not-so-subtle ‘artwork’ from the Foundation for Defense of Democracies. 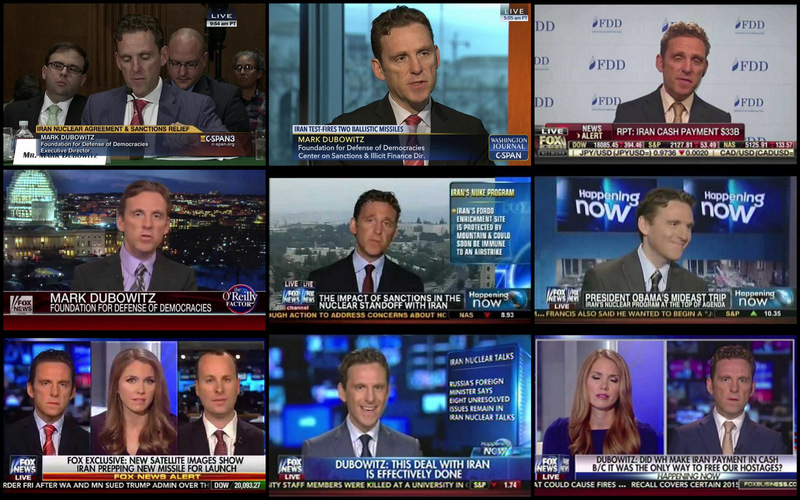 Mark Dubowitz, the article’s co-author, is the current CEO of the Foundation for Defense of Democracies (FDD), a neo-conservative think tank known for its advocacy for the 2003 invasion of Iraq. The foundation, for example, ran ads a year prior to the invasion that attempted to link Saddam Hussein and Yasser Arafat to Osama bin Laden. Dubowitz, despite his calls for a “better deal” in this case, has been candid in the past that his ultimate goal is regime change in Iran. In 2012, he wrote in an article for Bloomberg that “the goal should be regime change in Iran, not stopping proliferation.” Then, in 2015 he argued that “the only way to stop Iran from developing nuclear weapons was through a military strike.” Dubowitz’s “expertise” on Iran is also a mystery given that, prior to becoming CEO of the FDD, he worked for a venture capital firm and in the software industry. Ultimately, it is hardly surprising that the same voices that pushed for the invasion of Iraq are now pushing for the end to JPCOA and for subsequent war with Iran. Part of the U.S.’ and Israeli strategy in the Middle East, particularly following 9/11, has been based on toppling a string of governments – including Iraq, Libya, Sudan and Syria – and ending with Iran. The invasion of Iraq in 2003 was merely a prelude to the ultimate goals of the neoconservatives and their supporters: regime change in Iran and all other nations in the region that are resistant to U.S.-Israeli designs.